Review by AllTheBestFights.com: 2018-03-09, good finish between Regis Prograis and Julius Indongo: it gets three stars. The former Ibf and Wba light-Ww champion Julius Indongo entered this fight with a boxing record of 22-1-0 (11 knockouts) and he is ranked as the No.3 super lightweight in the world but he comes off the loss against current #1 Terence Crawford (Terence Crawford vs Julius Indongo); before this bout he had beat Ricky Burns (Ricky Burns vs Julius Indongo). His opponent, the undefeated Regis Prograis, has a perfect record of 20-0-0 (17 KOs=85%) and he entered as the No.26 in the same weight class. He fought twice last year winning over Wilfrido Buelvas and Joel Diaz Jr (Regis Prograis vs Joel Diaz Jr). 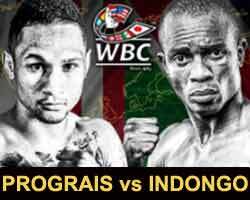 Prograis vs Indongo is valid for the interim WBC World super lightweight title. Watch the video and rate this fight!